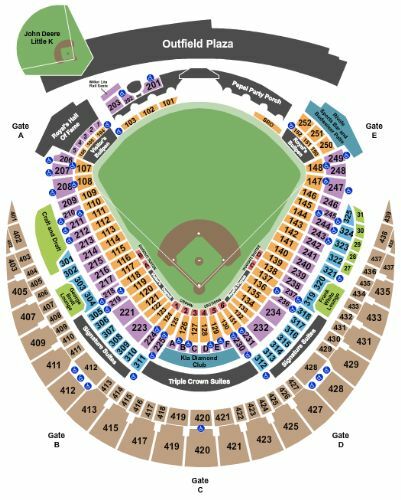 Kansas City Royals vs. Los Angeles Angels of Anaheim Tickets - 4/26/2019 - Kauffman Stadium in Kansas City at Stub.com! Access to Diamond Club. Access to the Club Lounge includes full service bar and food options. Padded Seat. Waiter service included. Access to Diamond Club. VIP Area/Club/Lounge access included. Royals Pregame Experience Package includes a Dugout Box game ticket in sections 116 thru 139 (orders of three or more may be split) | Exclusive pregame access to view batting practice from behind the dugout (weather permitting) | $25 food/beverage credit included with each ticket | Collectible Kansas City Royals memorabilia item (1 per person) | Parking pass (1 per order) | Ticket upgrades obtainable upon request |. Access to Crown Club. Food and beverages included. Fourth row. Includes access to a private bar. Includes pre-event meal. Padded Seat. Waiter service included.